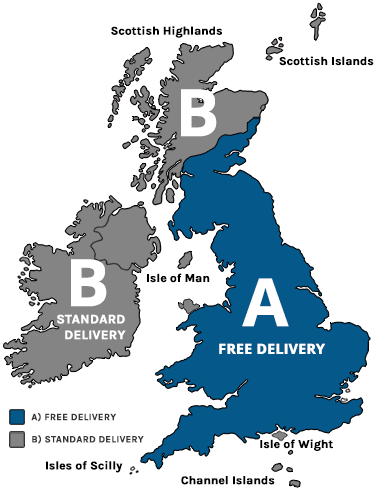 Digital Frames Direct have worked very hard to put in place an efficient and reliable Next Working Day Delivery service to most of the UK (see below), the cut off time for this is 4:00pm. We normally despatch all orders within 2 working days of receipt of the order subject to payment approval being received. Our standard method of delivery is by Courier which is normally delivered within 48 hours of shipping. During normal busy periods such as Christmas and Valentines our delivery times can be extended. We will automatically update you by email when we ship you order and the status on your account will change from "confirmed" to "shipped". We do our very best to package our products so that they arrive in perfect condition, but if your product arrives in less than perfect condition we will be happy to take the matter up with our couriers on your behalf. Please note that because of the value of the products we sell they must be delivered directly to you and signed for either by you or on your behalf. Whilst we could "leave it in the recycle bin at the front", as we are sometimes requested, this isn't possible so we would ask you to help us make sure we get your order to you safely and securely. If you are not satisfied with your purchase for any reason, you have the right to return your order within 7 working days of delivery on the provisor that the item is in its original packaging, the protective screen has not been tampered with and/or removed and all accessories are present.Your order must be unused and in its original packaging and must be in a resalable condition. We reserve the right not to accept any products where it has been used, damaged and/or defaced and therefore unsuitable for resale. Please be advised that we do not accept returns after 7 days from date of delivery. To return your item please contact us on 0117 330 2277 to book in your return and obtain a returns number, should you require us to collect your order there is a collection charge of £12.50, this cost covers the return of the item from your address to our warehouse, admin and inspection. The collection fee will be deducted from your refund. You can of course return the item back to us yourself. Should you decide to return goods yourself this way this is done entirely at your own risk and you should always ensure that you obtain proof of postage / delivery for your reference. We can not be held responsible for any items lost in transit. If a refund is to be issued this will be actioned within 14 working days of receiving the item. Should you wish to exchange a product please call us on 0117 330 2277 where we may book in your return and obtain a returns number, should you require us to collect your order the collection charge is £12.50, this cost covers the return of the item from your address to our warehouse, admin and inspection, which must be paid prior to your collection. You can of course return the item back to us yourself. Should you decide to return goods yourself this way it is done entirely at your own risk and you should always ensure that you obtain proof of postage/delivery for your reference. We can not be held responsible for any items lost in transit. Once the item(s) have been received we will process your exchange which can take up to seven working days. If you have received an item that is damaged please report this to us within 24 hours of delivery. When you contact us please have to hand your order reference number to enable us to resolve this in a timely manner. Please be advised we may request photos of the damage reported which we will require failure to do so may prevent us from resolving the issue.